I don’t really know when I got the idea that we should have a lending library at our house. It has something to do with loving these little boxes when I find them around town, it has a little to do with missing my grandparents who both have passed away, it has a little to do with procrastination. Because I can’t do homework if I’m building a library, sorry. 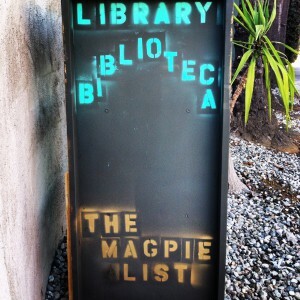 Also, doesn’t it make sense that The Magpie List should have a library?! Hello, we are in the business of inspiration. So cute, right? Some get super elaborate. Some have shingles. Well, ours does not look like this. There are plans of how to do this on a website, but that involves more sawing and measuring than I am able/willing to do (and money I’m willing to spend), and besides, I we had a perfectly good Ikea shelf that was just sitting, unused, in the garage. It’s like it was just waiting to be upcycled. 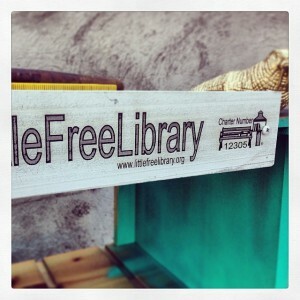 I’m finding myself very much in need of creative outletting lately, so the library was a perfect project. It didn’t go perfectly, of course, but it was a good lesson in patience for me. I couldn’t finish it all at once without abandoning an entire day or two of my regular life, so I had to be satisfied with running down into the garage for 15 minutes at a time in between loads of laundry or paragraphs of homework or even an entire weekend of Irish dance performances. Sometimes I milked an hour out of it, but the goal was 15 minutes. Either way, something else wasn’t getting done while I was stenciling L-I-B-R-A-R-Y , and for the first time in a long time, I was choosing what I wanted to do over what I thought I needed to do. We all seemed to have survive, pile of dishes and grade point average notwithstanding. It took much longer than 1 day or even 1 week. And: I spray painted the lettering on up side down. I guess perfectionism has no place in my garage either. So what my boyfriend insists you wouldn’t know is that I turned the whole shelf upside down so the lettering would be right. Because the lettering was tedious and I couldn’t bear the idea of starting over. And, anyway, I realized it doesn’t really matter if my library is pinterest-worthy. It holds books! Eventually it would be incredible to have a library stocked with people’s magpie selections, but in the meantime I happen to know there’s a book about Gypsies and a paperback copy of Heidi, just sitting there, begging to be read. 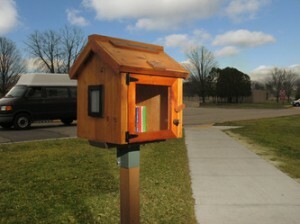 So come on down: take a book leave a book!